The marathon session of voting in the House of Commons that lasted through Thursday night and into Friday morning has ended. Following the nearly 12 hours of votes, MPs agreed to end proceedings and call it a day. The continuous voting was being used as a procedural tactic by the Conservatives in an effort to have the government release a breakdown of how much its carbon pricing will cost Canadians. The voting ended without that occurring. 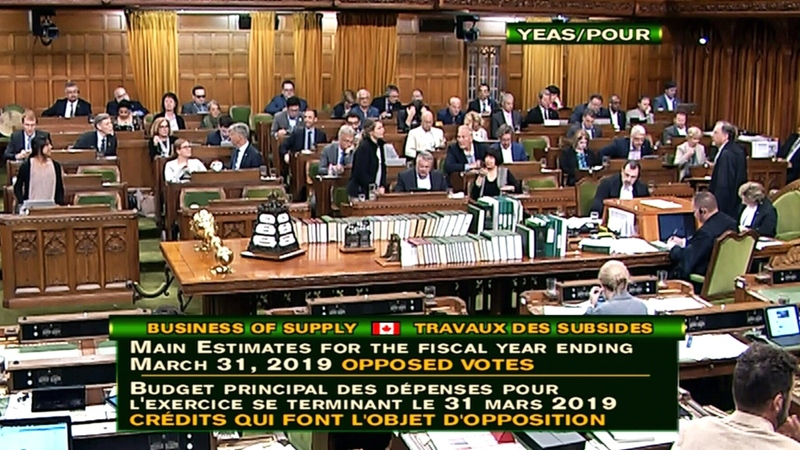 The nearly 200 votes were on the Main Estimates for the fiscal year ending March 31, 2019, making each a confidence vote as it dealt with budgetary measures. This that made it imperative for the Liberals to keep a full bench of MPs to make sure they win each one. “It is important to send a clear signal to the government that we want clarification about the Liberal government tax,” said Conservative MP Gerard Deltell on his way in to the Commons late Thursday. Many of the officials arriving for the marathon session carried overnight bags, snacks and blankets as they prepared for a long night. “I was hoping to be back for Eid. I have probably 5,000 or 6,000 people celebrating Eid back in the riding and we’re here playing games instead of representing our constituents. It’s unfortunate, but if they want to play games, we’re here to do the work,” he said. The House of Commons adjourned without the amendments made by the Senate to Bill C-45, the government’s marijuana legalization legislation being addressed. This means it’ll be Monday at the earliest that the government’s decision not to accept some substantial changes heads back to the Senate to decide how to respond. Depending on how the Senate feels about the government saying thanks, but no thanks to some of its more robust recommendations, the bill could be in for a few rounds of legislative ping pong, where it will be passed back and forth a few times between the House and Senate as they go over the final wording. Or, the Senate could accept the position of the elected House of Commons, and agree to wrap up the bill as is. Meanwhile, the sister legislation to the Cannabis Act, Bill C-46 regarding drug-impaired driving was passed by the Senate with amendments Thursday, forcing the bill back to the House for consideration of the changes. That bill will then follow a similar process of the government either accepting or refusing the changes. Next week is the last scheduled sitting week for the House of Commons, while the Senate could sit a week longer, in order to wrap up government business before the summer break. Other bills on the government’s priority list before rising: Bill C-59, regarding national security; Bill C-64 on abandoned vessels; Bill C-69 which deals with environmental assessments; and Bill C-71, the government’s gun reform legislation. MPs in the House of Commons are seen voting on one of more than 200 votes lined up by the Conservatives. Voting began on Thursday, June 14, 2018.